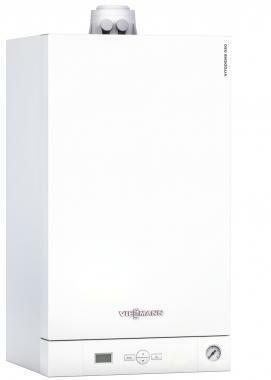 The Vitodens BPJD 050-w boiler is a combi gas boiler that is wall mounted and condensing. This boiler is a highly reliable unit and it boasts a wide range of accessories that makes the vitodens 050-W the perfect boiler for a new build home or modernisation of an older one. It is offered with two DHW output ratings, 5.9 to 29 and 8 to 35kW. This unit comes with integral instantaneous water heating as well as an electronic control unit for monostatic mode and weather compensated mode that is already placed into the unit. It comes with a frost stat so you can be sure you are getting a reliable boiler, also with this boiler being such an economical and efficient boiler that has a standard seasonal efficiency of up to 89% making it an B rated boiler as well as it having an output rating of 35kW and coming with a high efficiency modulating pump which is also rated A and having a modulation range of up to 1:4, this unit comes with an inox-radial heat exchanger and cylinder burner made from stainless steel. It has many different options such as its weather compensation, option of a plug in timer clock and wireless receiver. When installed with these options you give the boiler even more efficiency and reliability than it already has. This boiler is also ideal for installation in living areas with it having a low operating noise, being compact in its dimensions, and not requiring a pipe cover making it perfect to be hidden away out of sight out of mind. It also has an ease of wiring and improved access to serviceable parts (an example of this is the plate heat exchanger) so you can be sure you will be purchasing a reliable and cost efficient boiler. It has three years warranty as standard.